By Caz | December 7, 2018 | This post may contain affiliate links, which means we may receive a small commission, at no cost to you, if you make a purchase through a link. Read our Disclosure. When you’re in warrior two and a Momma goat saunters between your legs and nearly topples you over, you aren’t really in that zone of Zen. You’re scrambling to tighten your core and stay in place, a task made the more difficult by the fits of giggles that erupt from you. It’s about letting go of your preconceived notions of what yoga should be and allowing the present moment of what it is to enter. It may be a little distracting to hold your normal yoga positions, so you lose those benefits of building strength, flexibility, connecting to your breath and pushing yourself slowly and gently. 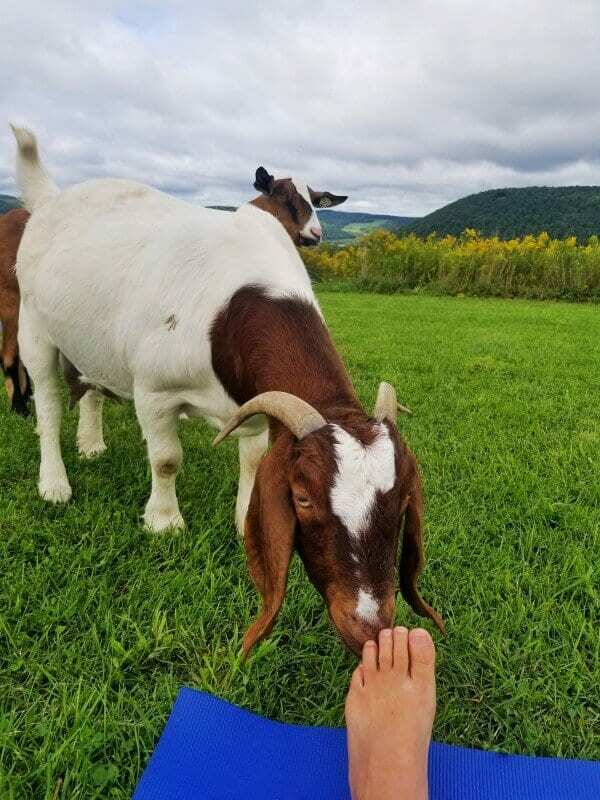 But, those little goats running in and around you, bring you fully into the present moment of life happening around you, so you can experience playfulness, gentleness and the odd goat cuddle or two. 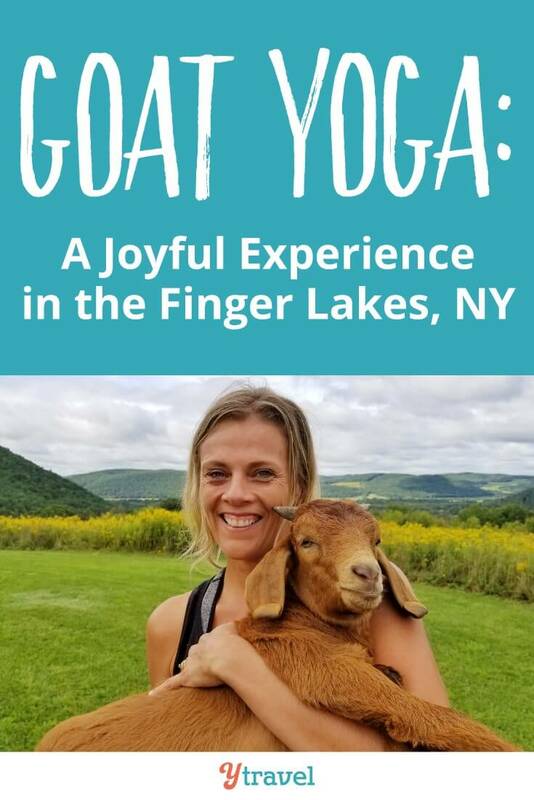 When I saw a wellness morning of goat yoga and spiritual healing during our time at TBEX in the Finger Lakes district I knew that was the experience for me. 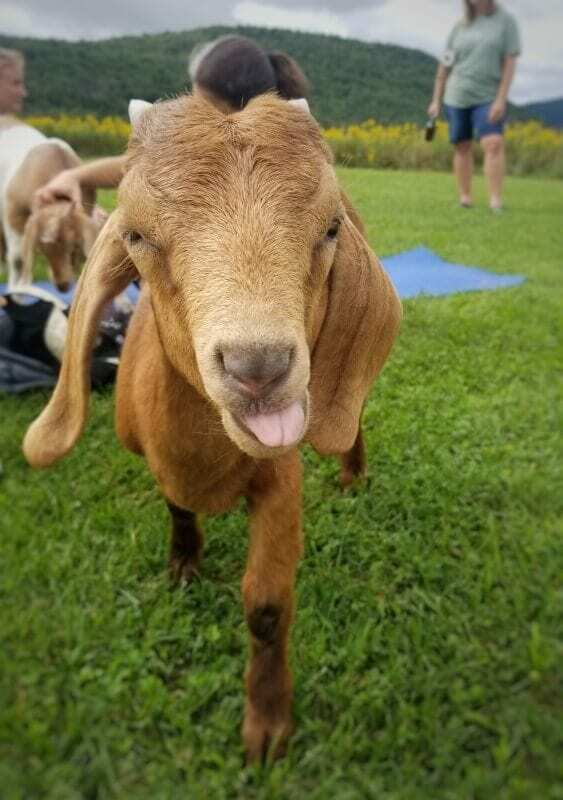 Forget the fact that the region is surrounded by more than 100 wineries as well as exciting farm to table experiences, I dropped the wine tasting opportunity for the chance to mingle with goats. 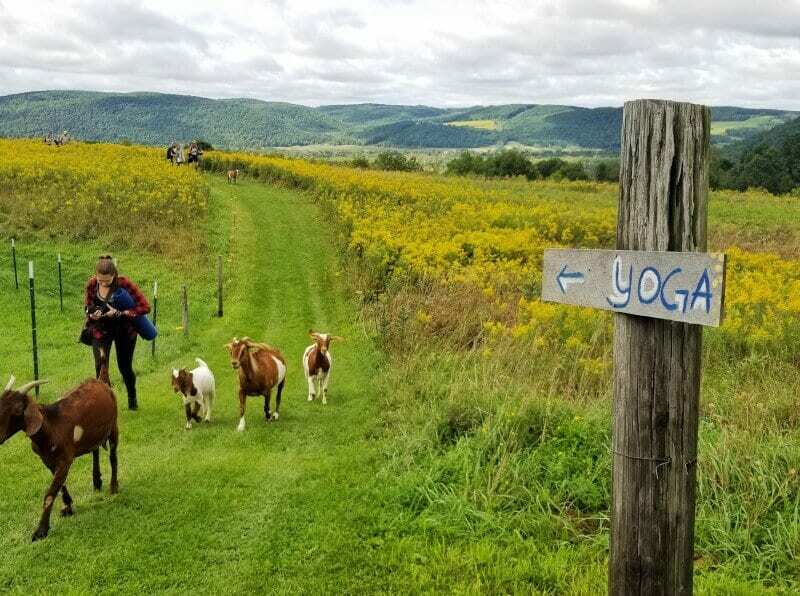 Our four legged hosts greeted us upon arrival in that curious manner, milling around the gate to see who their yoga buddies would be for the day. 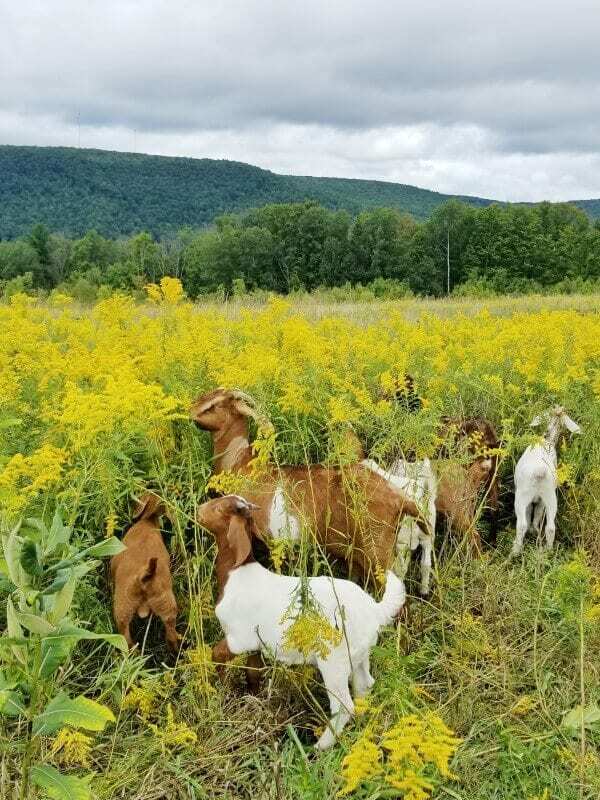 They walked along beside us through the yellow wildflowers in the field to a small rise on the property where we had gorgeous views over the lush green rural landscape. We probably had around 20 goats with us and they raced around the field stopping to eat the food on our mats or to playfully fight and headbutt each other and crawl around us. Some took the liberty of lying down on other participants mat so they couldn’t do much else than hold a lotus position for the remainder of the one hour class. Others nibbled at feet, sat in laps, and performed their own downward goats beside us. Each goat had their own personality so of course I attracted to me the kid who was just like my own baby, Savannah. Playful, energetic and demanding my attention, he kept coming over to stare at me, nudge me, hide behind my legs, play with me and seek out cuddles. At the end of the session, we lay down to attempt savasna. 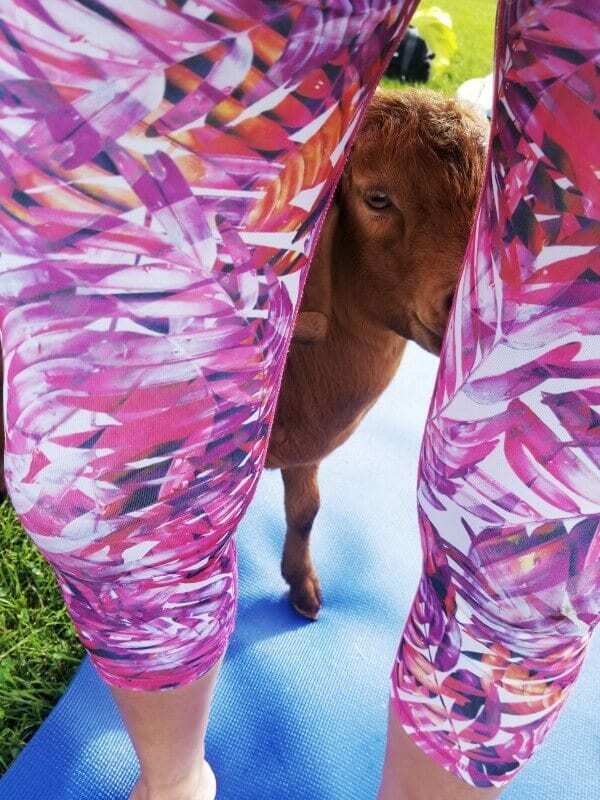 The lady behind me couldn’t do her favorite part of a yoga class as a Momma goat was happy chillaxing on her mat. With no goats around me, I laid down to close my eyes and tune into the spirit and energy world. I slipped into it and then a pair of goat hooves sprang through the air and landed up my stomach. The air exhaled loudly and I jumped to find my little Savannah clone on my stomach. He rolled all around me, gently digging in his hooves and asking for a cuddle. We spent the rest of savasna laughing and wrestling. Just like Savannah, he was not going to let me have one minute of my own quiet rest. The unsuspecting jump and cuddles that always bring me out of whatever it is I’m doing to pay attention to her. Hey look at me Mumma. Come play with me. Here in this moment is the joy of play with me. Don’t pass it up for anything else. I found an uncanny connection with that goat, whose name I do not know. To me he was just Savannah and gave me a connection of pure joy and love. 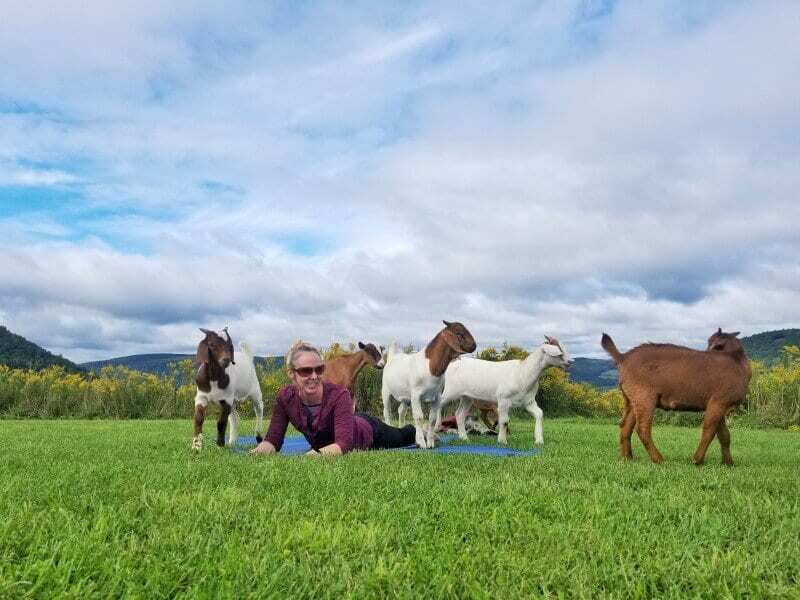 For that, goat yoga was really worthwhile and offered me a memory of a class that will never be forgotten. And that is why we travel, for pure experiences that bring us love and joy. Of course, my little Savannah and I had to have a cuddly photo afterwards. Her giggles and absent reply had me wondering. She has that kind of otherworldly magic. 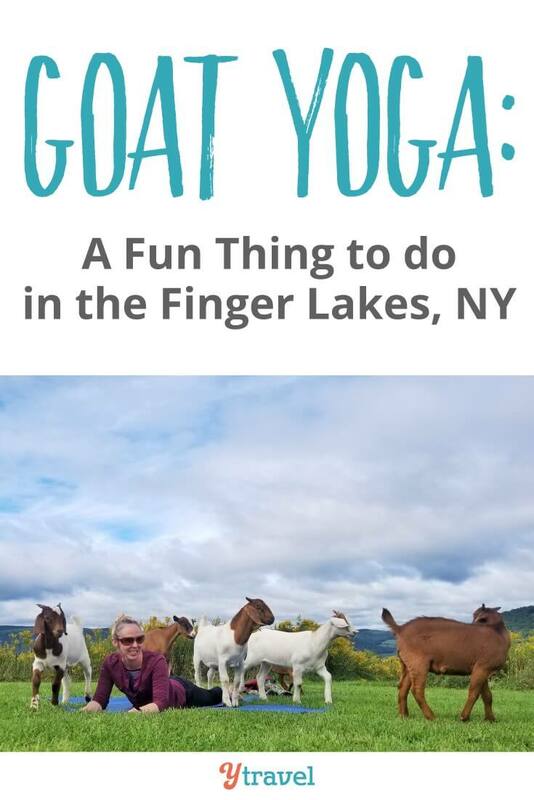 You too can participate in goat yoga when you visit the Finger Lakes region in New York state during the warmer seasons. (I was a TBEX guest on this experience hosted by the homestead). 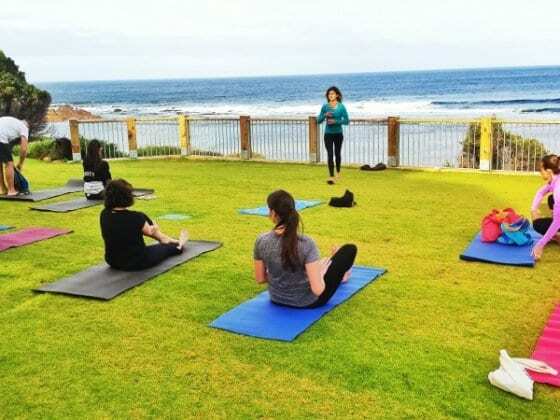 It’s held on ZiegenVine Homestead, by local yoga instructor, Elizabeth Moses. The owners of ZiegenVine decided to dive into farm life and embrace a more sustainable lifestyle. 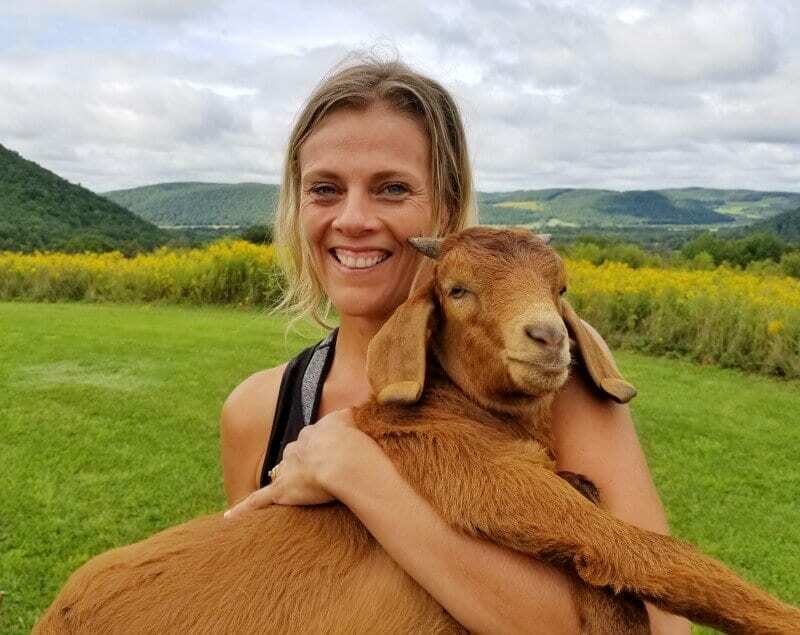 They fell in love with their goats and instead of using them as food, decided to allow their personalities to bring joy and present moment living to yogis. While in the region, I also recommend visiting Healing Spirits. Owner, Matthias came to visit us after our yoga class. He brought with him some deliciously refreshing sweet birch tea, and rose heart elixir, a healing tonic that bought a fire to my belly! He took us for a short walk around the property and proceeded to pick up a bunch of weeds to tell us about how you can use them to heal your mind, body, and spirit. Turns out that we weren’t just walking over weeds but a thriving farmacy. All these weeds we walk over each day actually provided us with medicinal plants to heal any kind of ailment and to strengthen our bodies. 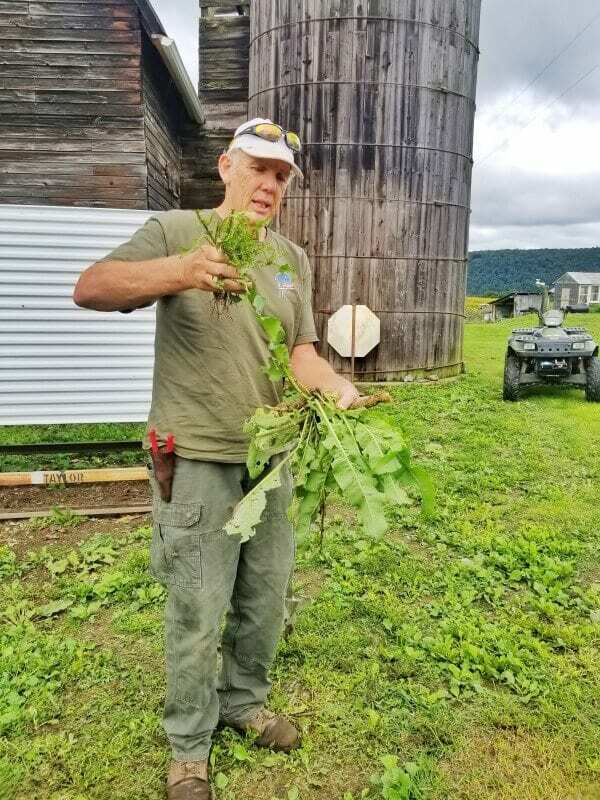 He turns these weeds into tonics, teas and salves, which can be purchased online or at his farm. You can also attend various classes he holds on his property. 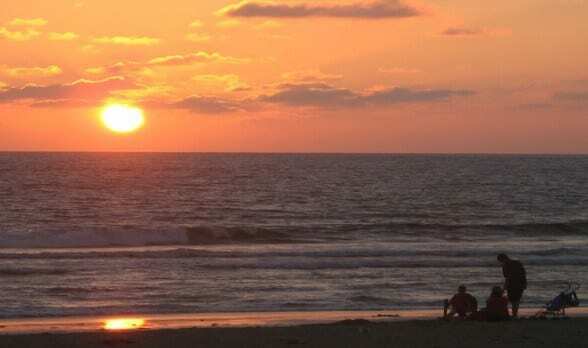 I was fascinated and as I hold his hand during our closing circle, where he chanted a goodbye for us to remember how special we are and our Mother Earth, I felt a gentle, pure, powerful loving energy flowing through his hands. I’ll be making sure I’m stopping to smell the weeds and bring them into my body more often. I stayed at the Radisson in Corning, which was comfortable and in a great location right at the end of Market St.
A two minute walk to morning coffee is wonderful. It was about a 15 minute walk to the Corning Museum of Glass, where our TBEX conference was held. It sure helped me walk off those chardonnays I was having at the Radisson bar. The bar became quite the gathering point for us. The chicken wings here were absolutely delicious as was the local chardonnay. I think it was possibly the best I’ve had in the US. 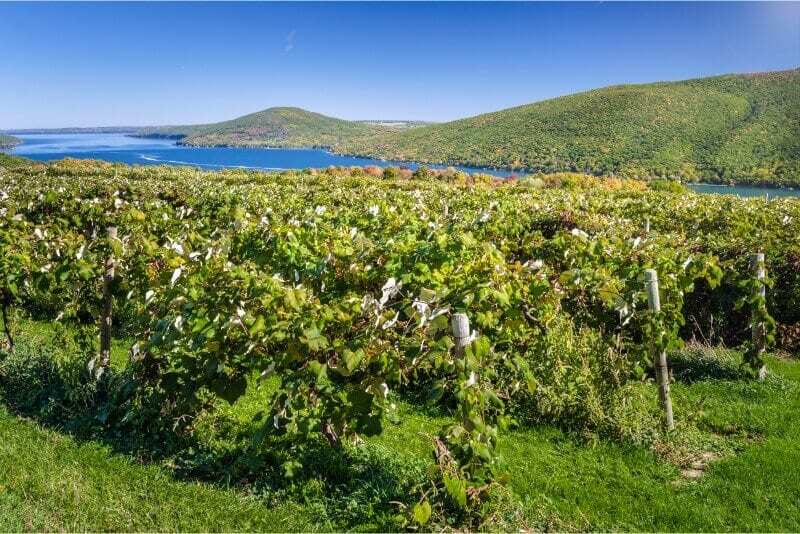 Accommodation: Book hotels and apartments in Finger Lakes directly on Booking.com, or read hotel reviews for Finger Lakes on TripAdvisor. Car Rental: Book your car rental for the Finger Lakes region with our partner, Rentalcars.com Click here for prices. 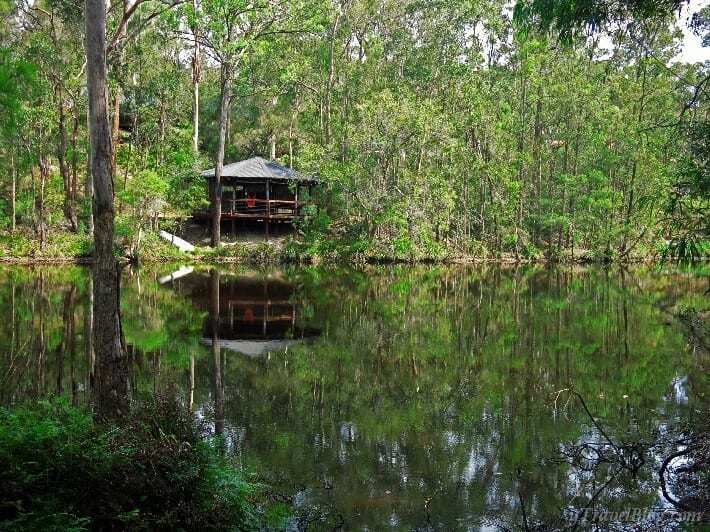 Viator is a TripAdvisor owned company and offers small group tours to popular attractions. 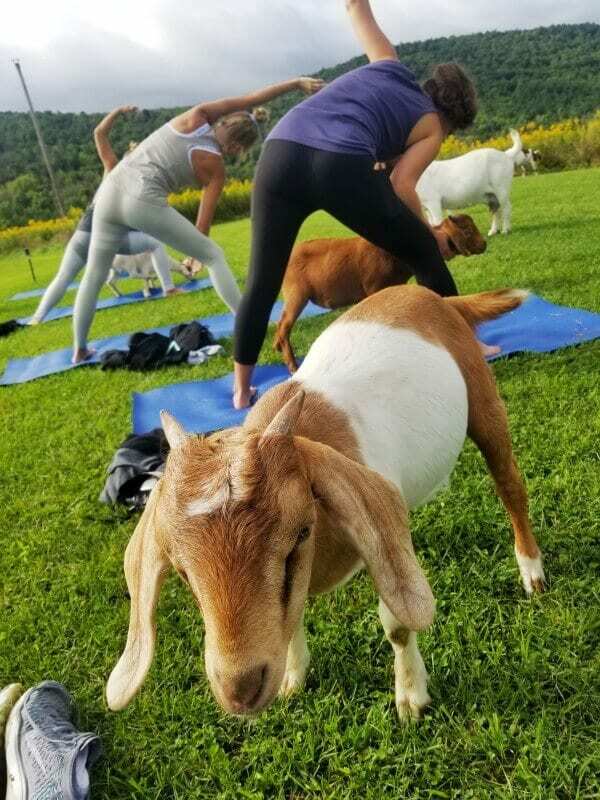 Have you done goat yoga before? Do you think you’d love it or it would be too distracting? 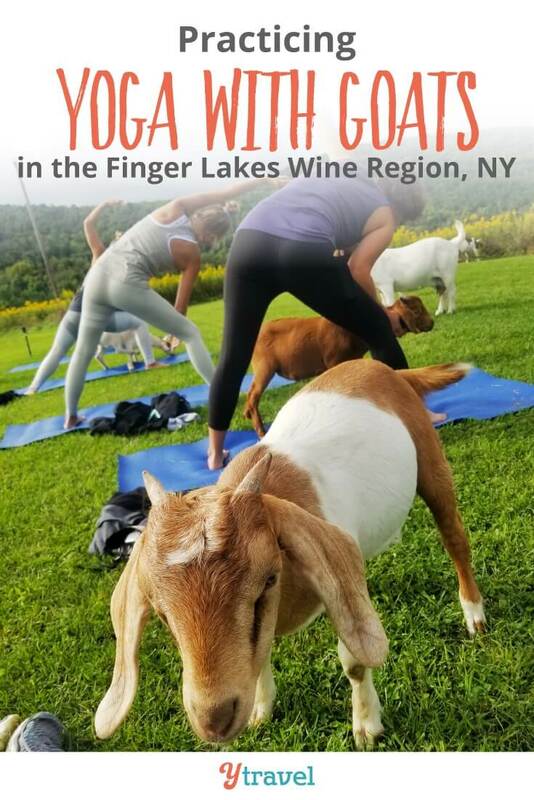 Goat yoga sounds like an experience to be had! Glad to see you in the finger lakes area. Until age 13, I lived in Corning Manner just a couple miles from Corning and then in Caton, a small town 7-8 miles away. At the time it was a winding road and a long commute for my father. We also fished in Seneca Lake just 15 miles north of Watkins Glen and still visit with a friend who grew up in Glenora on the west side of the lake not far from several vineyards. It is a beautiful area. Finally need to mention that Elmira, just 20 miles from Corning is the “Soaring capital of the World”. Harris Hill airport has long been known for it’s excellent glider launching.